Story by Jurgen Wohlfarter - "Leopard, Leopard burning bright in the trap of the night, what immortal hand or eye could frame thy fearful symmetry?" Not quite as romantic as good ol' William Blake's poem, yet the sight of this seven year old male caught in our trap was a jaw dropping one. It was a mild Saturday late morning when Caroline of Landmark Foundation called me: "Last night a leopard had killed another sheep on Nooitgedacht farm". She was on her way with a trap - we had a 24hr window to catch the culprit and GPS collar the animal for further monitoring." We met at Alpie's house and he pointed out where the dead sheep lay. Daniel another neighbour, came to help and showed us exactly where it was dragged to. Too far off drivable terrain even with the 4x4, so Caroline made the call and the trap was set up not far from the kraal where the sheep spend their nights. The dead lamb placed inside as bait and the trap covered in bushes so it would give shade to the caught animal, we left and hoped for the best. For the next few days, I drove out to check on any traps and to release animals caught in them if necessary; after all it was that leopard we were after. The 24 hour window passed without success and so did some more days. Frustration started to set in and we started to make plans to abandon the mission and move the trap. Then, on the 1st May (last thing on my mind on this busy weekend, I got another call from Caroline, all excited, telling me that Alpie's workers spotted the caught leopard when opening the kraal for the sheep that morning. All wheels were in motion, a vet on his way from Riversdal and her colleagues from Knysna bringing the GPS collar. If I could just make sure no-one gets close to the trap so that the leopard doesn't stress any further. I grabbed all my paperwork and moved my "reception" out onto the road so that I could direct my guests due to arrive from there, while standing guard. Finally by 16:00, with some curious neighbours and farm workers looking on next to the road, the Landmark people arrived with the vet and even the director of Landmark Foundation, Dr Bool Smuts (he took a detour from his holiday to be there), excitement built up steadily! First the vet went to check on the animal and estimated its weight to prepare the tranquilizer dart. We all watched from afar and as the vet approached with the dart gun ... the leopard was visible even from behind the bars. The sheep close-by stampeded as the leopard gave a proud roar. Another five minutes went by until the leopard was safely sedated. Then came the moment, green light signalling us that it was safe to approach. How exciting to get a close look at this beautiful creature of the night. 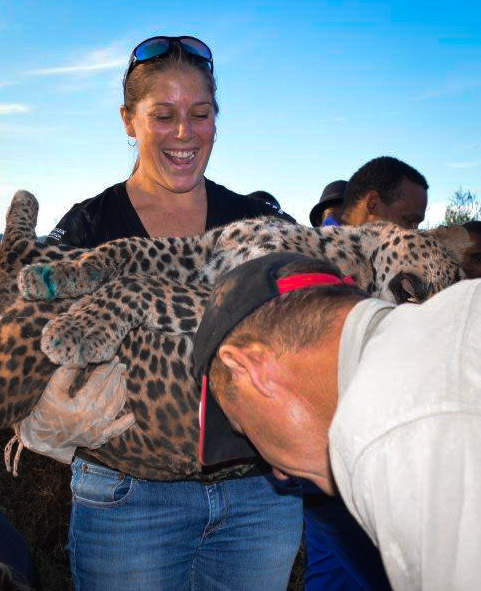 The vet and the Landmark staff worked fast and with great skill, treating the leopard's wounds, applying eye drops and even ticks were removed. A tiny piece of skin was collected for DNA sampling too. The weight measured (29kg) and the teeth, paws, tail were measured (the tail shorter due to a possible rivalry fight) and of course photos of its spots were taken. These serve as "finger prints" to compare with previous photos of other leopards in the Langeberg. In the meantime, cell-phone cameras kept clicking away with everyone taking "selfies" with the mighty beast, while the vet was calmly doing his job - remarkable! Lastly, the GPS collar was fitted and while everyone walked back to the vehicles, a reversing dose to wake the animal up was administered. I returned to Simonskloof. After all, I was still on duty.... Later that evening while preparing for a well-deserved, celebratory braai, Caroline walked into the fire's circle of light to announce that her 4x4 had run out of battery power while checking on the leopard's slow recovery progress. First things first: a glass of wine, a bite of dinner to get her fueled up again! We made her some coffee in a flask (it looked as if it was going to be a long night after all) and then drove Caroline out to the leopard with my trusty Nissan 1400, a set of jumper cables and some blankets to cover the leopard to keep him warm while recovering. When we arrived at the 4x4, almost getting stuck in the freshly ploughed field myself, the leopard still lay next to the trap making some movements, too lively for us to approach with the blankets, yet not strong enough to walk off by himself. Excited we watched, leaving the jump-starting of the battery for later. Hours go by, I dozed off at 15-min intervals while Caroline continued to keep a watchful eye. The leopard showed very slow progress, we felt very sorry for the animal and every now and then a shooting star crossed the icy night sky above. Then, at 05:45, well before the first light of dawn, the leopard gathered his strength and moved off into the Renosterbos belt behind the trap. We were relieved and reconnected the batteries - constantly alert and watching our backs (seen too many Hollywood movies) for an unexpected return of the "beast". Caroline's Toyota kicked back to life and we made our way through the soft field past dongas in the dark, back to the road and made our separate ways, happy to know that No 48 is alive and safely back in the hills again. The way forward: "Our" leopard is the 48th leopard that was saved by Landmark Foundation from getting killed by ignorant people. Fortunately our neighbours know the benefit of having leopards roam freely, despite the loss of livestock they suffer. He is the 24th GPS-collared leopard, this enables Landmark Foundation to track his every move and if the livestock owner adheres to a non-poisoning policy, as well as certain improvements in the keeping of his livestock suggested by Landmark, then he receives market related compensation for any further stock losses caused by the "GPS leopard". And this is where WE (you and I) come in! After such a successful "rescue" mission I came up with an idea of how you can support the saving of these awesome animals. With any future booking at Simonskloof you'll have the option to make a donation at your own discretion via Simonskloof and we'll match your amount to the max of 10% of your booking value! To see more about their good work, visit Landmark Foundation's website. Once we know more about the leopard's movements, we'll keep you updated.